Huge 17" dome protects seed not only from squirrels but also from rain and snow. Wrap around seed tray accommodates your favorite birds like Cardinals and Finches. Made in the USA and can be pole mounted or hung. This sturdy metal feeder is designed for White Safflower Seed (and it works wonderfully for that) but we also LOVE it for feeding Coarse Sunflower HEARTS (no shell). Pictured here, the Pine Siskins at our house are really taking advantage of the Sunflower Hearts we are providing! This feeder is Easy to Clean and the large metal tray on bottom means less seed falls to the ground. 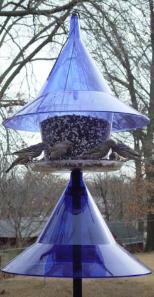 Feeder holds about 1 1/4 quarts of Safflower or Coarse Sunflower Hearts. 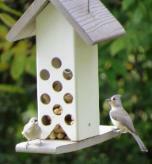 One of our favorite feeders for Finches and Pine Siskins! Durable recycled material, heavy-duty screws, steel hanger, and quality craftsmanship (made in the USA!) make this hanging tray feeder one that will last a lifetime. 16 inch x 13 inch tray. 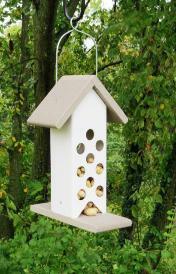 Same materials and quality craftsmanship as our BCRECHTL Feeder only in a smaller size - 10 inches x 10 inches. Made in the USA of recycled plastic! 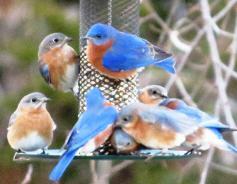 and it becomes a Bluebird favorite! Exclusively from Birds-I-View: Designed and hand-crafted by BIV owner Steve Garr. An Easy, CLEAN way to feed so many of your favorite birds. 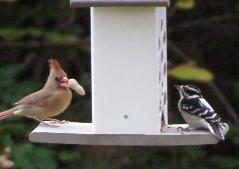 Cardinals, Blue Jays, Tufted Titmouse, Nuthatches, Woodpeckers and Chickadees all love peanuts in the shell. HOWEVER....starlings and grackles usually do NOT eat them! Easy to fill and made of sturdy, durable materials.